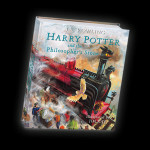 The Harry Potter and the Philosopher’s/Sorcerer’s Stone illustrated edition was released in October 2015. It features gorgeous illustrations by artist Jim Kay. You can check out artwork from the illustrated edition below. We had the chance to interview Jim Kay in 2015 where he talked about designing the artwork below. You can read that by clicking here. Jim Kay is currently at work on the Prisoner of Azkaban illustrated edition. We anticipate that it’ll be released in October 2017 and that we’ll see jacket artwork early next year.